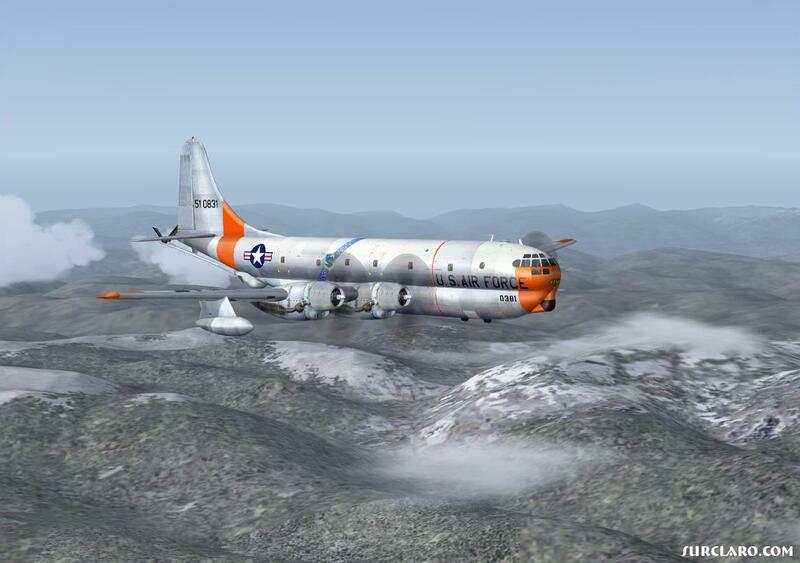 "Old Dawg on the Hunt"
Conduct one Group 7 or California Wing-oriented project per quarter. While we are perilously close to completing two of them (renovating the Group 7 communications room and improving the Group 7 computer systems) and are making substantive progress on a third (augmenting the effective education/mentoring program) we will need to apply the aspects of our goals that need to have calendar dates associated with them. These include the SAREXes we might be contemplating (or making up for) as well as the culmination of my dreams to put on an SLS/CLC for Group 7 and surrounds. In any event, it will be an around-the-table planning forum to get us revved up for 2013. Also, along the lines of preparation for our 2013 goals is the fact we have committed to minting two new Mission Pilots and four each of Mission Observers and mission Scanners. So we need to put the arm on those of us who would want to move into these ES ratings and see to it that they are move along the pipeline. 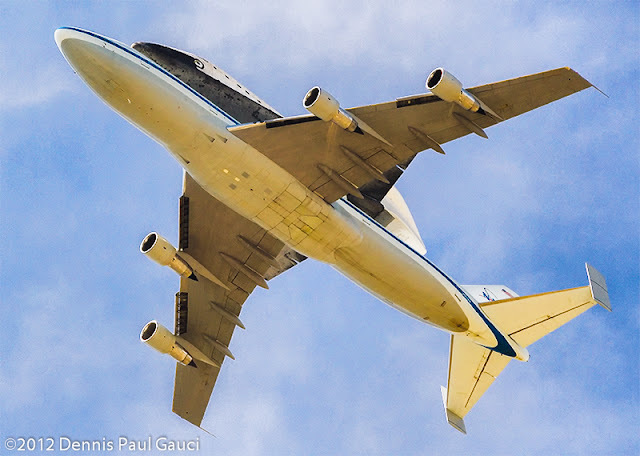 Group 3 and Group 7 are hosting a 2-Day Mission Scanner Training Course at Riverside Senior Squadron 5 in Riverside, CA. The dates of this course will be February 9-10, 2013. Please see the attached flyer for all of the information you will need to know to get registered. If you have questions please feel free to contact myself (squadron5cd@gmail.com) or Craig Newton (cap.newton@yahoo.com) and we will assist you. Please pay close attention to the prerequisites as they will be strictly adhered to. The only task for Mission Scanner that must be done in the aircraft is O-2018 (Operate Aircraft Communications Equipment). This course will not provide either of the (2) Exercise Participation Sign Offs that are REQUIRED to complete the Mission Scanner SQTR. There was a flyer sent out accompanying e-mail. I shall forward it to all interested upon request. Let's avail ourselves of this, shall we? In closing, I wanted to remind all of you that the meeting of December 20th will be a casual get-together NOT AT THE CLUB HOUSE but rather at a local bistro nearby. We will be zeroing in on the location at Thursday's meeting and I shall post the time and directions here. Stay tuned; same Bat-time, same Bat-channel. 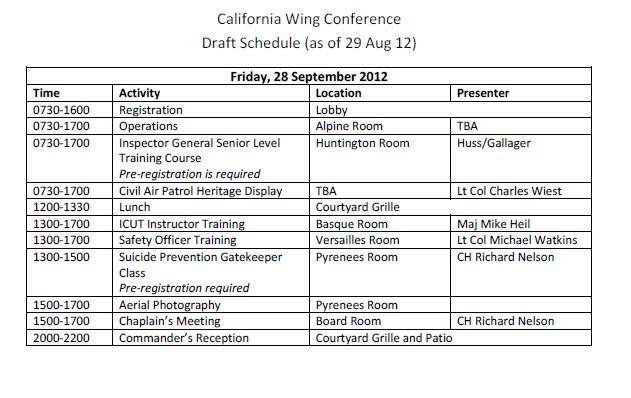 This message details the California Wing response to Operation Constant Watch 2012. All interested communicators are encouraged to participate. All corporate issued HF stations, fixed, mobile, portable, conventional and ALE should participate in this exercise. This message details the HF procedures for the exercise including conventional HF operations. The exercise operation plan has been uploaded to the files section of the CAWDC Yahoo group. You can request access to the Yahoo group by sending an email message to: CAWGDCMembers-subscribe@yahoogroups.com Include your CAP ID in the message. Messages without a valid CAPID will not be allowed access to the Yahoo group. Please make sure that all available corporate HF stations participate in this exercise. Stations do not have to operate for the entire 24 hour period to participate in this exercise. Mission Sign in: All stations have been asked to enter a Ground Sortie in WIMRS with the CAP ID of all members present at that station. Beginning at 0900 local 0163CACAP and 004PCRCAP will transmit the exercise message to the identified Wing message stations. Wing message stations will in turn transmit the exercise message to their respective participating Wing stations. The exercise traffic will be transmitted via Voice or Text dependent upon the status of the receiving station when a successful connection is made (station is attended = voice, unattended = text). The CAWG station located in Eureka will attempt to deliver the exercise message to Alaska Wing. Oregon and Washington Wing stations with previous successful connections will attempt to send the message to Hawaii Wing. Upon receipt of the exercise message participating stations will compose a response. 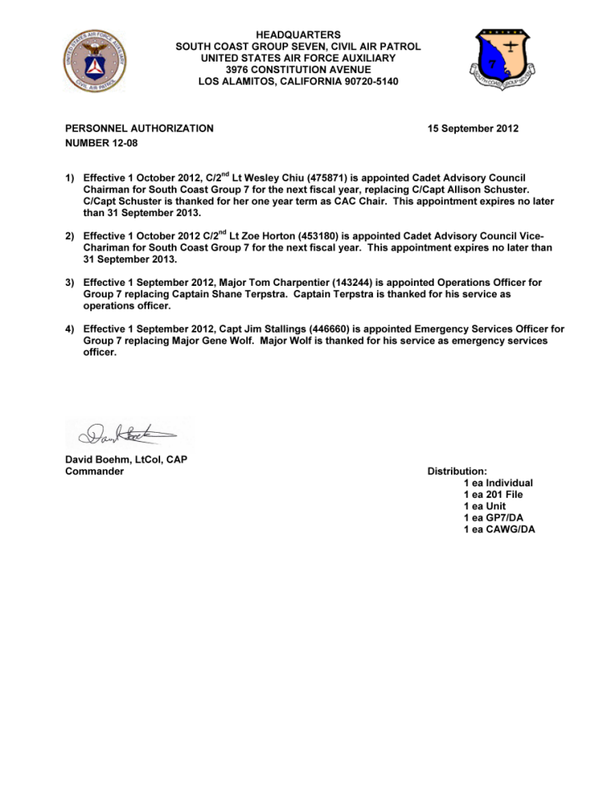 The response will be sent to 0163CACAP during the response window assigned to the station's Wing shown in a later paragraph of this document. If 0163CACAP is attended the response will be sent via voice. If 0163CACAP is unattended the message will be sent via text. 0163CACAP will produce a summary of all responses that will be forwarded to the exercise staff at the completion of the exercise. If a station cannot connect to 0163CACAP they should attempt to relay the message via other ALE stations. If this is not successful the station can relay the message via conventional HF during the net windows detailed in a later paragraph. California Wing will conduct a directed net for the Region to allow conventional HF stations to participate in the exercise. The exercise message and response will be transmitted and received by participating stations during the conventional HF net windows. Each net will be done first on frequency PCD and then on Frequency PCC to maximize participation under prevailing propagation conditions. This week's meeting will primarily focus on safety so that we may all refresh our currency in that area. CAPT Valerie Guaci will present a video on Workplace Violence and there will be a supplemental talk about talk about Christmas shopping parking lot safety. 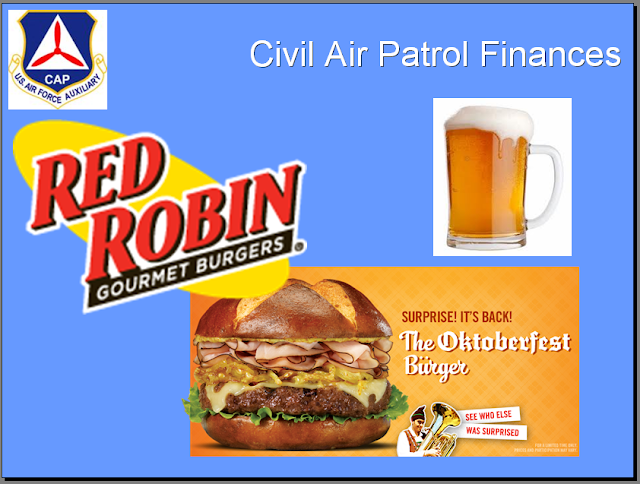 1LT Bodo Rau and the finance committee will meet and discuss, among other things, our proposed server/network and internet access with our IT officer, 2LT Lance Boland. This convenes in advance of the meeting at 1830L. The comm room upgrade is in its final throes with the painting and ceiling tiles completed by 1LT Kevin King and 2LT Mary Oh (shown on the left). The only effort remaining is the patching of the panels and switch covers, running of power lines and cables, mounting the server in the rack, and stringing the CAT 5 cable. Important notice before I sign off: Last week's postponed SAREX will resume this weekend at KFUL. 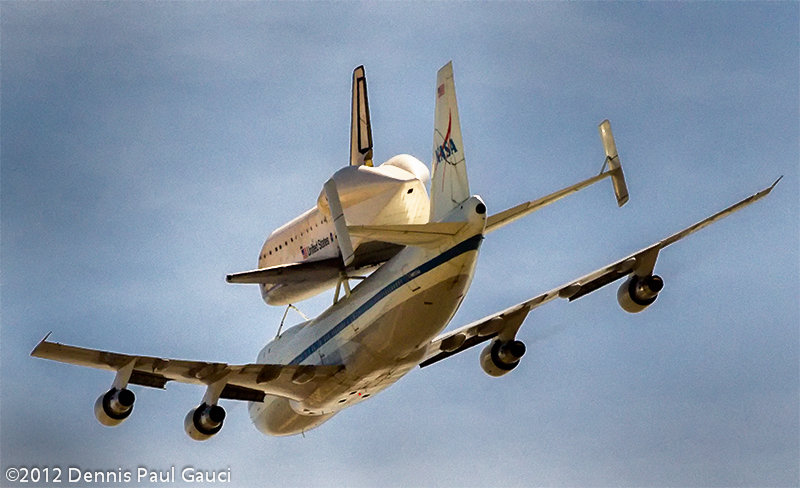 Last weekend the El Cajon rendition was held while weather and aircraft unavailability caused our cancellation. 1LT Rau will refresh our memories on the detail of this weekend's efforts. If you stare at one point for too long, small details will disappear. It's known as the Troxler effect or Troxler fading. It seems to affect small details away from the center of your field of regard. Of course objects at the center of regard can also disappear but that is a different topic (related to how the optic nerve leaves the eye). You did not know that you turned 71 yesterday, did you? Well, in fact, you did -- although you don't look it! 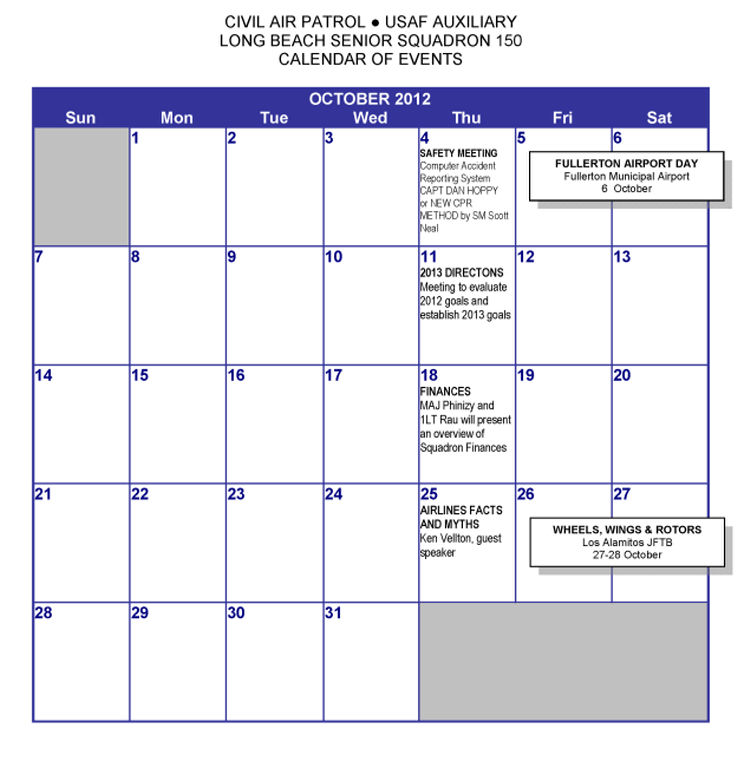 Civil Air Patrol came into being by the signing of an administrative order signed by New York mayor Fiorello LaGuardia on 1 December 1941 (ironically seven days before the attack on Pearl Harbor) and has since served as the United States Air Force Auxiliary as well as an effective volunteer organization in service to the community, state, and nation. 71 years ago today, a dedicated group of visionaries created an organization designed to serve the country in a time of war. After helping to win the war by defending the homeland, these same visionaries transformed the organization into what it has become today. Those of us that have chosen to serve our country and communities through the Civil Air Patrol should be proud that we are the living legacy of those visionaries. 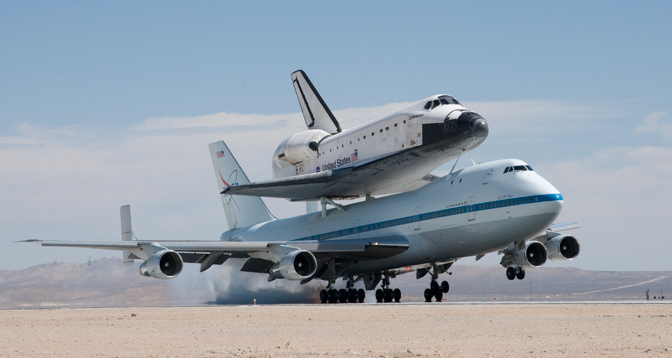 For these past 71 years, we and those that came before us, have been there for others in their time of need, help create the next generation of leaders and raised the nation's awareness about the aerospace. This is not only our organization's birthday but our birthday as well. Let's celebrate our accomplishments and celebrate our membership in the finest volunteer organization in the world. Best wishes for a happy Thanksgiving to all Squadron 150 members and all visitors to this site! Obviously, the squadron will not meet this evening but will resume activities on 29 November with a session devoted to final planning for the upcoming 1-2 December SAREX. This will be a joint exercise at Fullerton and Gillespie Field in El Cajon. Owing to government funding cutbacks, this will be a limited-sortie exercise but those who need mission support training (MSA, MRO, AOBD, etc.) and sign-offs AND WHO ARE SAFETY CURRENT are encouraged to attend. Please plan on attending the meeting for coordination and preparation. The safety meeting will be an interesting one with CAPT Valerie Jordan presenting a video on workplace violence. We will devote remaining time to a redux and after action discussion of the SAREX as well. I want to call your attention to the (possibly) penultimate meeting of the year where we will have a substantive discussion of our direction in 2013. While we have set down our FY 2013 goals, we will need to determine how these goals will be met. And, on that subject, please note that 2LT Marty Oh and his crew have made substantial progress on the comm room renovation. This Saturday will be a major effort to complete that with a ceiling-tile-and-paint-fest. I am sure Marty could use some extra painters and brushes! That commences at 0900 at the club house. Final comment: mull over whether you all want to meet on 20 December as well and, if so, what you'd like to do. I would like to suggest a short meeting and then all of us repairing to the Ready Room for a pre-holiday get together. Again, happy Thanksgiving to all. The meeting this week will be devoted to map work including gridding charts as well as LAT/LON familiarization. 1LT Dave Martin conducted our last effort in this area and it proved to be very successful in training members to accomplish their pre-mission planning and completion of their CAPF 104s. 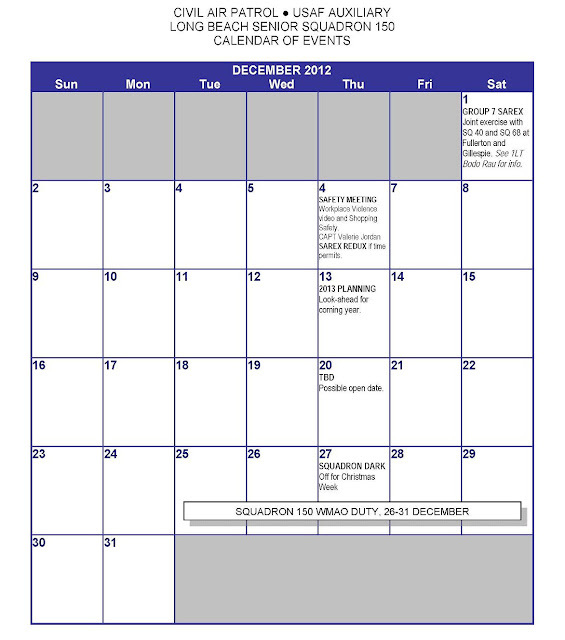 The November calendar features some interesting events -- all focused around preparation for the SAREX that Squadron 150 will be conducting with Squadron 40 over at Fullerton on 1-2 December. The meeting this week will be our monthly safety meeting and the topic will be "Winter Driving" presented by CAPT Alexander Smith. 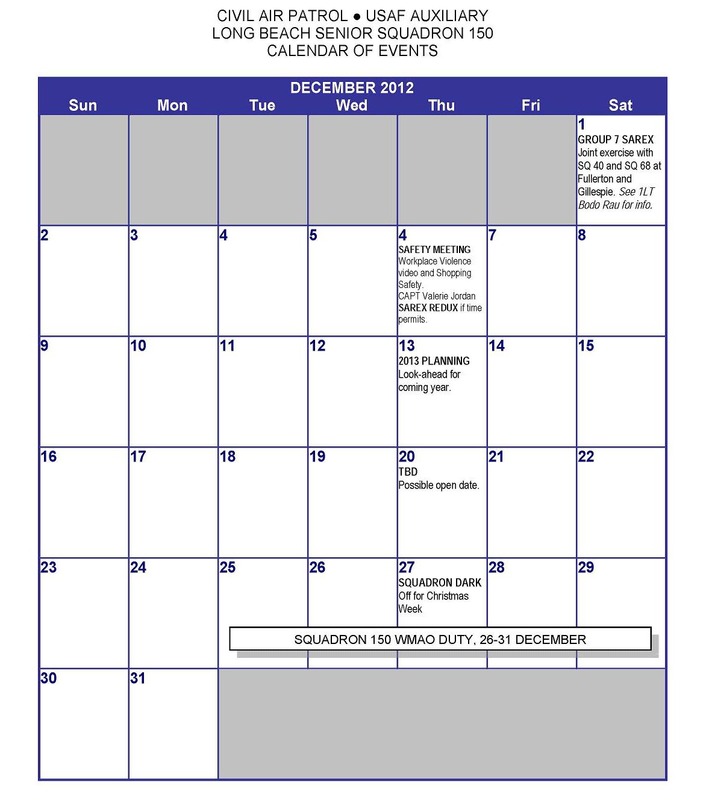 Afterward, we will need to discuss several important matters, principally finalizing the Squadron FY 2013 goals and addressing our meeting topics and planning for the anticipated SAREX we will be conducting with Squadron 40 in Fullerton. On another subject, this past Sunday, the squadron participated in a recruiting effort with Squadron 153, Squadron 41, and other units at the annual Wheels, Wings, and Rotors exhibition and air show aboard Los Alamitos JFTB. The weather was flawless, the show was very entertaining, and the times were good. I personally was very proud of those in our unit who volunteered their time and effort to make this a successful recruiting foray. Special thanks goes to 2LT Paul Koons and CAP Alexander Smith and the others who braved the cold and dark to set up the venue and man the tables. 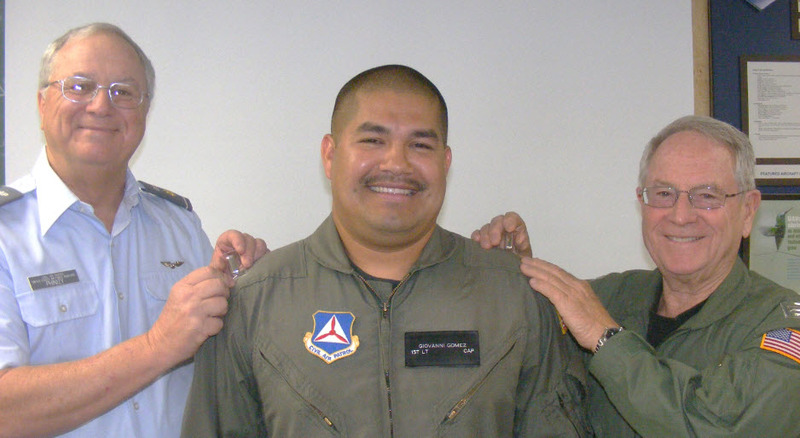 Please also join me in thanking MAJ David Walters, 1LT Bodo Rau, SM Frank Reinmiller, and CAPT Mike Cardenas for helping out as well. I am especially grateful for CAPT Valerie Gaucci and 2LT Dennis Gaucci for their assistance and support. Anyway, do NOT fail to show this Thursday; we got some powerful work to do! This Sunday: Wheels, Wings, and Rotors.. 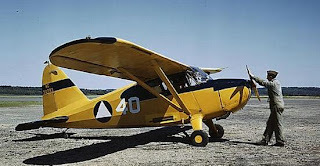 IMPORTANT NOTE: CAPT Van de Brake, the Squadron 153 CC, calls your attention to the NEW arrival time of 0700 PDT -- per the flyer. We will need folks around that time to help with the set-up and initial recruiting effort. On a personal note from me,. wear your flight suits or BDUs or USAF uniforms if you like so that [potential recruiting prospects will get an idea of what Civil Air Patrol offers in this area. Look forward to seeing you Sunday. The meeting this week will feature a guest speaker, Ken Vellton, courtesy of 2LT Paul Koons. Ken will present a talk on "AIRLINES: FACTS AND MYTHS" and it promises to be an interesting evening. So, see you there. (Actually, I have some family business to attend to so I'll see you next week.) Be good or CAPT Alexander Smith will tell on all of you! This will cover CAP, Wing, and our own finances exposing the details of an admittedly unromantic -- yet essential -- topic. Nonetheless, we will keep it short and painless so that any after-market discussion can be accommodated at our "Ready Room". Squadron 150 will begin a project to extensively re-model the Group 7 communications room. If you have stored or donated non-CAP items (items not assigned to a unit in ORMS) in that room, we ask that you please remove them by 21, Oct. 2012. In two weeks (22 Oct. 2012), if the items are not removed, we will be offering them to any who wishes to take them. Note that the Group 7 room will be open and available during SQ 150's meeting hours -- 1800-2100 Thursdays and on Saturday, 13 October. If you wish to make other arrangements, please contact Major William Phinizy (k6whp@socal.rr.com) or 2LT Marty Oh (martyoh18@gmail.com) for particulars. If the debris remains unclaimed, then we will be offering on a first-come-with-a-truck-first-haul-it-away basis. This program will wrap up on 31 October and the actual clean-up and remodeling effort will begin. Our stated goal is to turn the room into a communications room ONLY -- and no longer have it be a storage facility. We are targeting several weekends in November for the actual work and will be soliciting volunteers for that effort. I am pretty sure we could get the unit to spring for pizzas and soft drinks for all who participate. While the change in Ops Qual may have come sooner than expected, there is no recourse other than completing the ICUT curriculum. It should not take a member with current communications skills long to complete ICUT. Please refer to previous messages to the ALL list and the current 100-1 for information on the ICUT process. 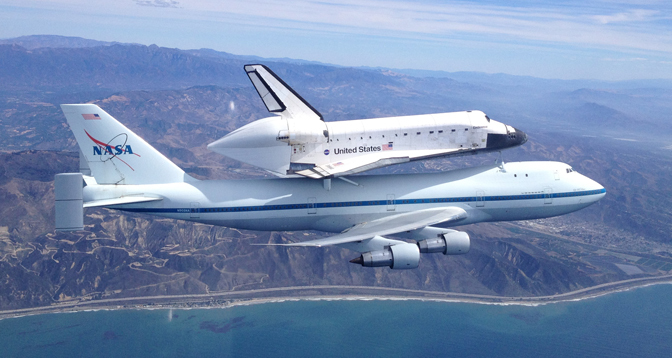 MAJ Dave Walters found a site that contains some spectacular video of the shuttle being ferried on it's last flight over Southern California. I was unable to link the video here directly, but if you will click on the link here, it will take you to the site where these are embedded. Thanks to you too, Dave! We will meet this Thursday and discuss our progress to date as well as where we are going in the upcoming FY. While we have not accomplished all of these goals as yet, they were originally scheduled as CALENDAR YEAR GOALS and I want to take us to a FISACAL YEAR schedule so we can get a head start on Group's request for our goals. And, yes, it's a neat accounting trick to give us more time. But I view our progress as a continuum and periodic re-evaluation will allow us to adjust our course and allow us make the objectives we originally set down more relevant with the passage of time. I am a weasel, am I not? Anyway, I would appreciate your reading our original goals document, burnishing those not already accomplished, and/or developing some ideas new ideals. I have discussed the new ideas with some members and, based on this, tt will be an interesting and informative evening. 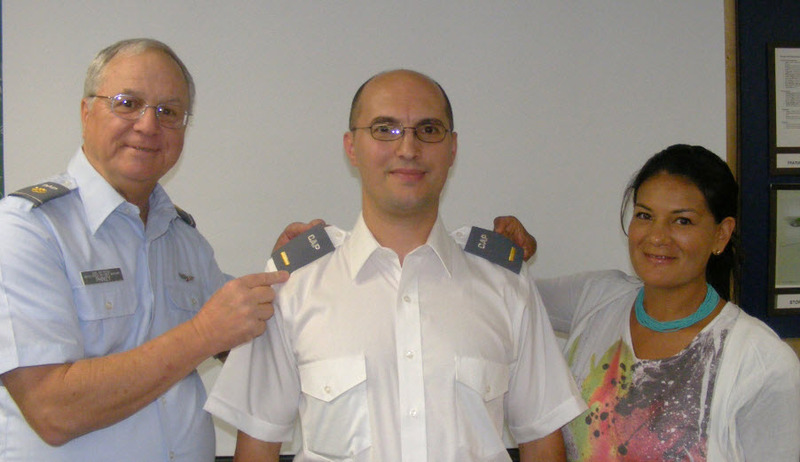 A note of good news: Our Safety Officer, CAPT Dan Hoppy, has well mended and promises (threatens?) to re-appear. So then there's that! 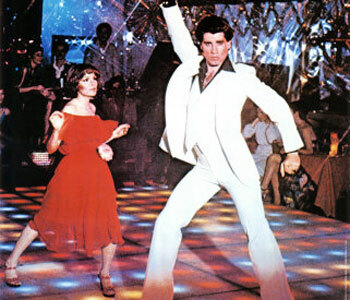 I have been advised by CAPT Jim Stallings, G7 ES guy, that the Saturday Night Fever SAREX being held at the Jackie Cochran Airport has had another 206 added to the fleet. Jim advises that you should jump on that like white on rice and Hoover up some right seat time. Also -- ALSO! -- CAPT Stallings is going to present a session on the new CAPStar web-based mission software this Saturday morning from 0900 to 1200 PDT. It will be at the clubhouse (G7 HQ) and will be free to all who wish. That means no approval, no CAPF 17s. Just show and go! The CAPStar training will be held at Gp 7 HQ, 3976 Constitution Ave, Los Alamitos JFTB this weekend, Oct 13th starting at 9am. If you have a laptop with wireless capability, please bring it with you. We expect the session to take less than two hours. We have about 10 members that have signed up and we can handle another 10 fairly easily. Who should come? People on the Operations and Communications track will benefit the most. See you Thursday -- and Saturday! 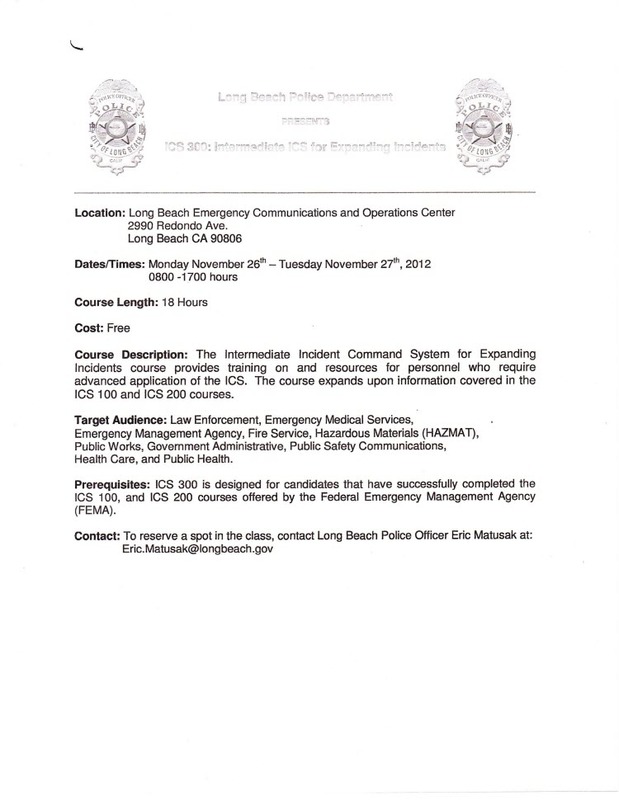 Per CAPT Paul Saba, the Long Beach Police Department will be presenting an ICS 300 and ICS 400 class in November. The fliers are below and may be downloaded here. This coming Thursday we will have a safety presentation by SM Scott Neal on CPR. Scott is a certified EMT and will bring us up to speed on several CPR techniques. It is anticipated that SM Neal will build this presentation into a full-blown CPR program so that members of the squadron (and group) will be able to receive a qualified CPR certification if they need one. Actually, that's a pretty impressive pilgrimage of membership and -- if you ask each of these folks -- you will find that they had a grand old time and are spoiling for more next year. Care to join us? Guaranteed you will have a ball! Congratulations to all the award winners from this year’s CAWG Conference in Ontario. Below is a list of all the Wing-level awards our members from Group 7 received yesterday at the conference. I want to make sure everyone understands this is a list of the WINNERS of California Wing awards for this year – THIRTEEN in total from Group 7! I honestly could not believe how many of our members won considering the stiff competition from the rest of the Wing this year. This list continues to prove that Group 7 has the most professional, hard working, dedicated CAP members in California Wing. Again, congratulations to all!! Let me add my warm congratulations to CAPT Crhis George and the and our brethren and sistren fown at Squadron 68 for their achievements. Look forward to seeing you all on Thursday! 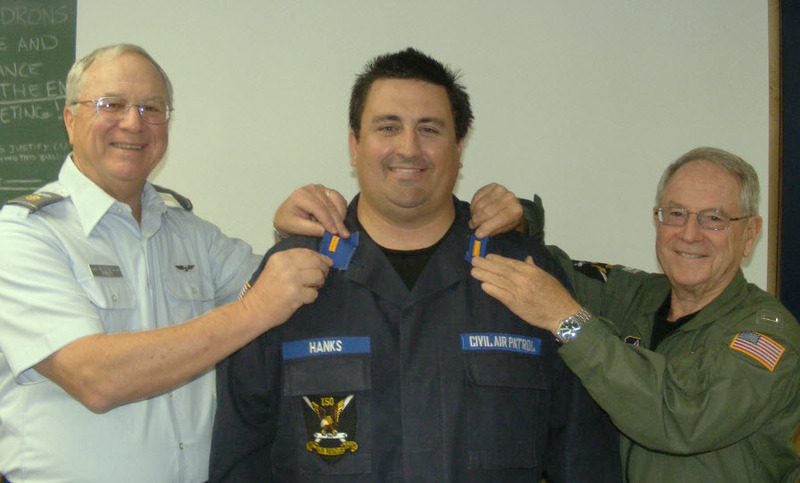 Congratulations to all the newly promoted officers above and sincere thanks for your efforts on behalf of our squadron. 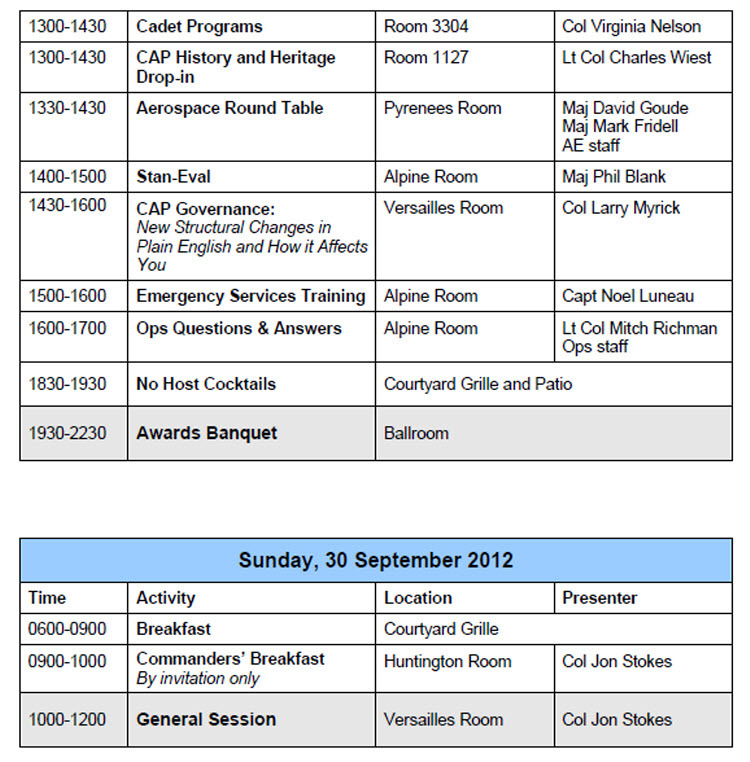 Below is the revised CAWG schedule from this weekend per Group 7 Commander, Lt Col David Boehm. See you there! This coming Thursday will be devoted to a promotion ceremony, CAP uniform resources commentary, and a picture day for 1LT Emily McLaren's cousin. We will be taking pictures and would like the promotees to invite their friends and family to attend and participate in the "pinning" ceremony. Afterwards, we will gather for a group photo for Emily McClaren's cousin and other commemoratives as time permits. 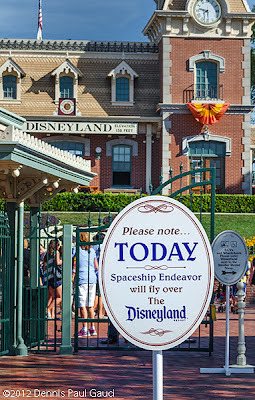 Note to CAPT Smith: It might be a good time to take some pictures of the staff so we can refresh the SQ 150 staff board. We will close up the evening with a short discussion of hints and tips on CAP uniform resources. 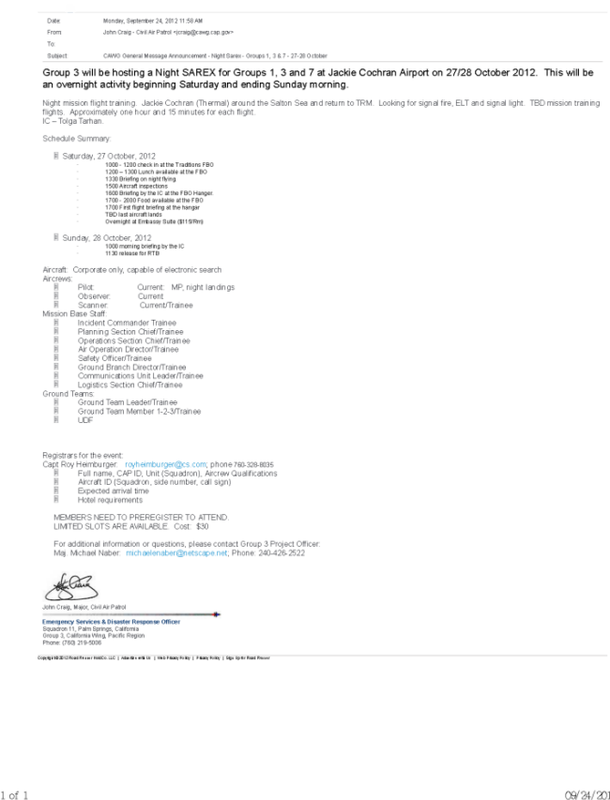 Please note that there is a Group 3 SAREX opportunity that will eventuate on 28-29 October and a USCG Basic Inland SAR Course on 12-13 January 2013. Follow the links to the blog post and information. 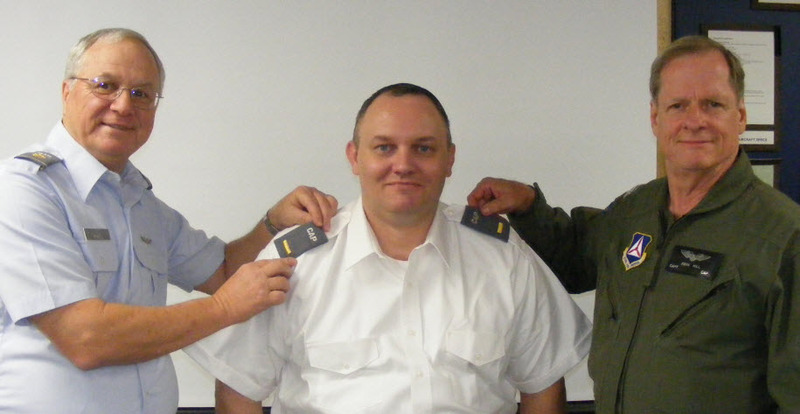 San Diego Senior Squadron 57 is hosting a Basic Inland SAR Course (formerly SAR Management Course) on 12-13 January 2013. This is an EXCELLENT opportunity for base staff personnel, especially PSC's, OSC's, AOBD's, GBD's and IC's. 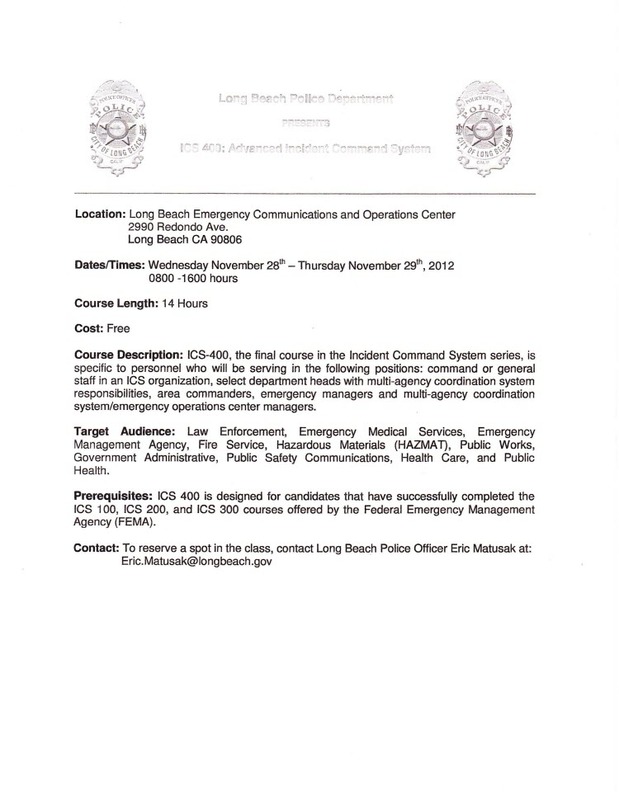 This course is taught by the AFRCC Ops Chief who is an excellent instructor with decades of experience. The course will be held at the Naval Training Center (NTC) in San Diego, 12/13 January, 2013. The courses are 0800-1700 both days. The course is FREE to attend, however travel, lodging and meals are the attendees' responsibility. We will be asking for a donation which will get you breakfast and lunch on Saturday AND Sunday for those interested. Details will go out to the attendees once we have it all finalized. Space is limited to 30 students, 10 of which will be reserved for outside agencies. *How do I qualify to attend? What do I need to do to reserve a spot? Send me the following information to reserve your spot. 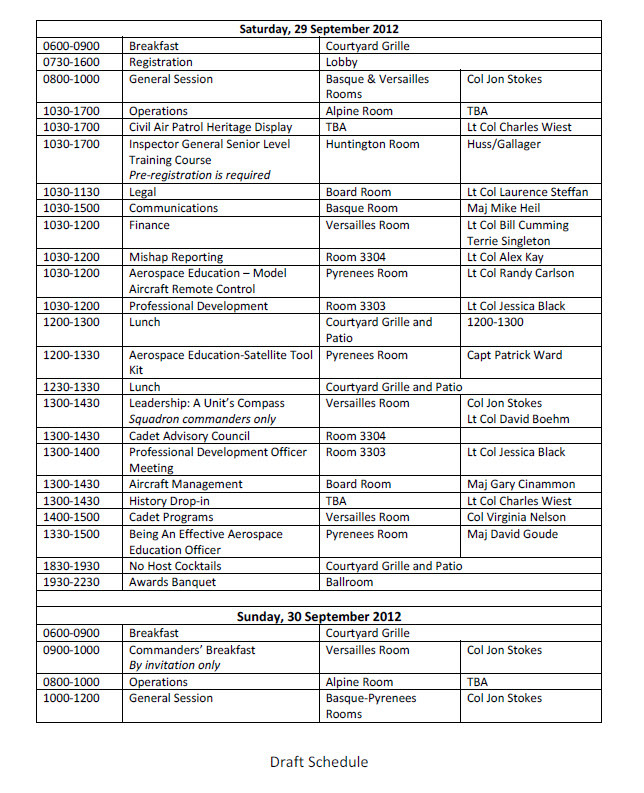 Your squadron/group commander's recommendation to attend will need to be sent to me (via e-mail) NLT 1 November 2012. I encourage you to disseminate this to any interested parties. 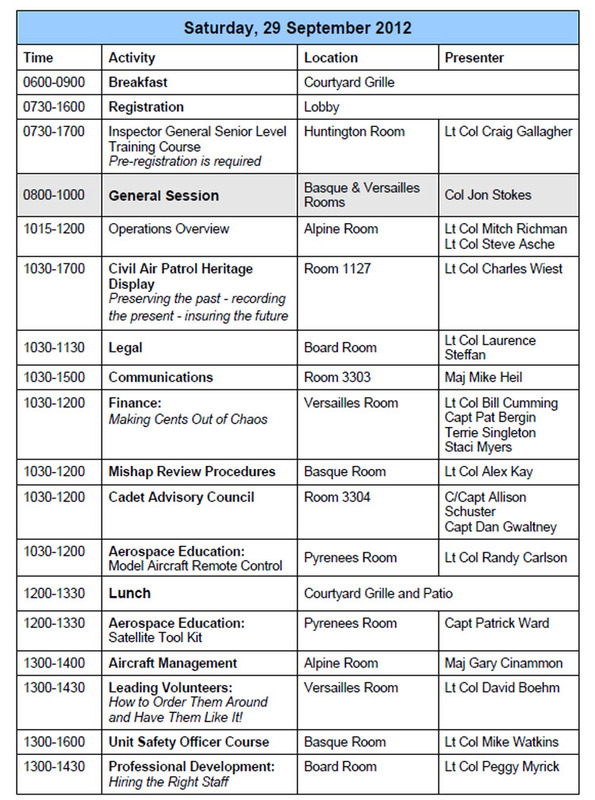 Please note that I will be happy to approve of ANY QUALIFIED Squadron 150 member who wishes to attend this event. Please plan now so you will not be disappointed. Click on the links above in the e-mail for further information. 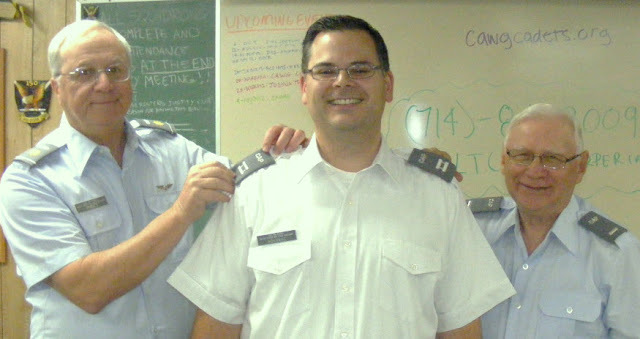 Note that CAPT Jim Stallings will be taking a position at Group 7. Jim is one of the members of Squadron 68 who was material in making our SAREX at Chino so successful. Also, CAPT Terpstra will be stepping down in favor of MAJ CHarpentier. 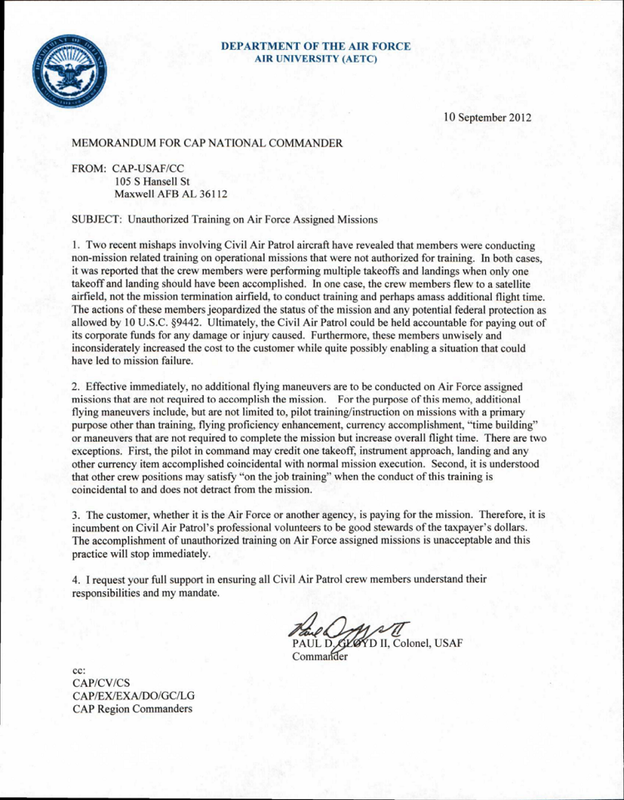 A couple of meetings ago, it was mentioned that the USAF had issued an advisory to all CAP aircrew personnel against engaging in unauthorized training on its assigned missions. 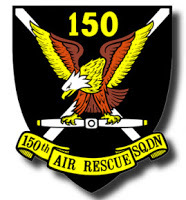 The appropriate letter was included in the weekly e-mail sent out to you the squadron 150 member. In the off-chance that you did not get to review it, I am re-posting this letter on this venue for your convenience. 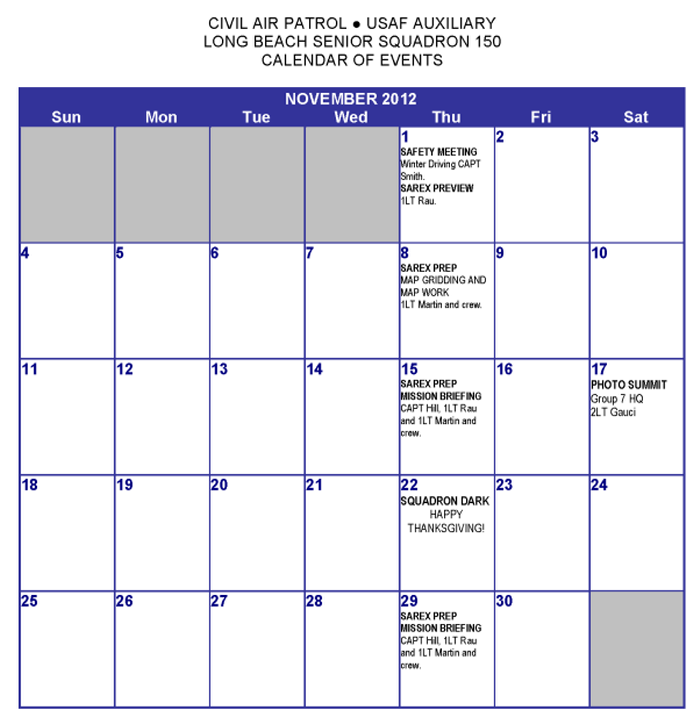 If you have not been before, you should seriously consider attending one of these as it broadens your perspetive on Civil Air Patrol immeasurably. (It also goes to credit towards one of the requirements for the rank of MAJOR.) And the Ontario one is freeway close. I am not nearly as nice as our beloved as our spittle-flecked tyrant leader. When I get this ICUT thing figured out, I will rain down electronic purgatory on all of you until you all are radio-active and THE best communicators if the California Wing if not all of Civil Air Patrol. MAJ Krause and 1LT Hong, Commander of Squadron 56 and I have been working with Fullerton Airport to support their Airport Day which is coming up on Saturday, 6 October. 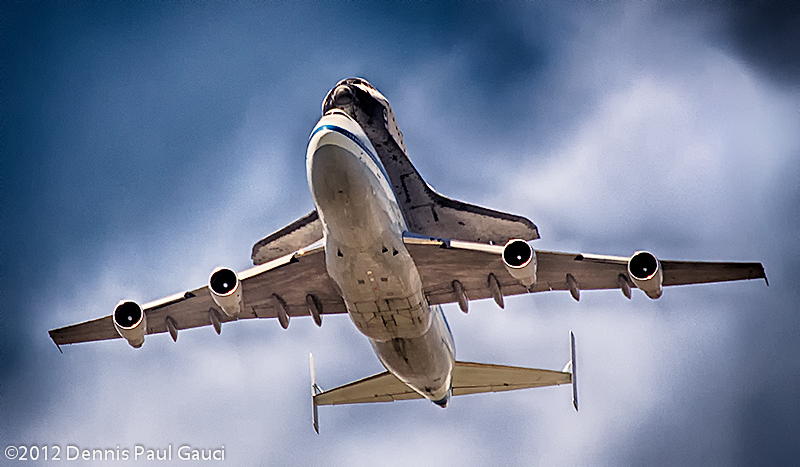 This is an open house and NOT an air show. It is an out reach event from the airport to the community. It is also a recruiting and public relations opportunity for CAP and an opportunity for Cadets to gain experience with crowd control and airport activities. Squadron 41 is planning to fly in a glider and tow plane, Squadron 68 is planning to bring their SAR vehicle and we will have 743CP there. My sincere thanks to Jerry Civalleri, Linda Abrams, Bodo Rau, and Daniel "Wing and a Prayer" Hoppy for accompanying me to the Group 7 luncheon last Saturday. It was a wonderful, well-attended soiree, and Messrs Rau, Hoppy, Koons, and Frerichs received Achievement Awards from Group for their efforts this year. While the squadron OTY honorees went largely to other units, it was confided to me that our unit's efforts did not go unnoticed and we will be in serious consideration next year. 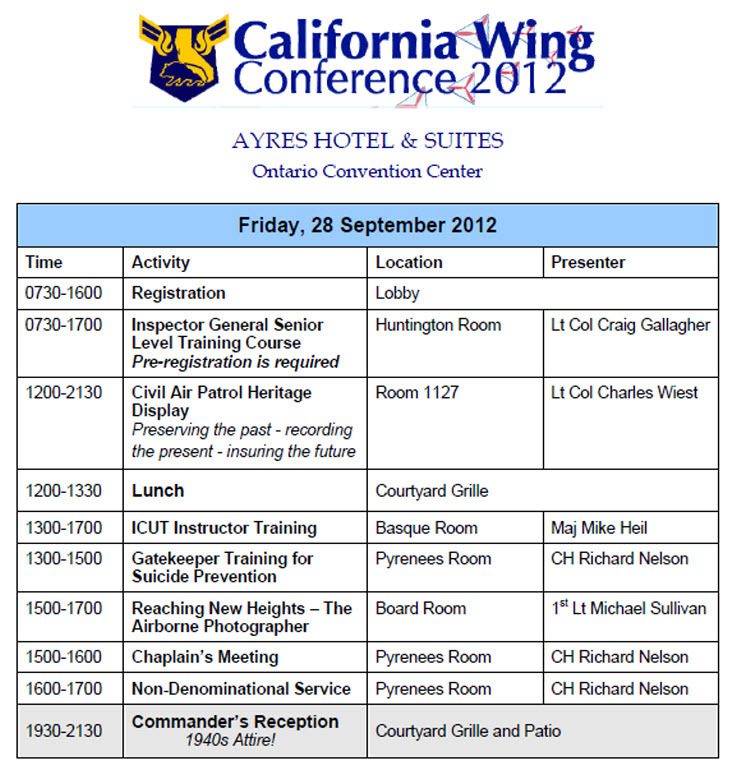 That said, I look forward to this year's CAWG convention and more of you participating. These events are an excellent way to gain perspective and allow folks to "recalibrate" our efforts to make an impact and work with Group and Wing to accomplish CAP's mission. We will be a presence at subsequent events like this, count on it. If you gentlemen can be available at the designated time, I would appreciate it. Others -- curious or industrious -- are most welcome. 2LT Lance Boland will present a comprenhensive talk on this subject and lead all of us through drills and practice so as to sharpen our skills. We need to understand the military birthright of our CAP heritage and prepare ourselves to be sharp when called upon to participate in the various ceremonies and exercises in this organization. It will be important to attend -- and it will be a fun meeting as well. This will be devoted to a ceremony for our recently promoted members as well as picture day for the squadron. We want to send along a photo to 1LT Emily McClaren's cousin to pick up his spirits and wish him well. You are encouraged to wear your uniforms -- Emily has requested flight suits but anything will do. Also, we can review uniform wear and follow up on uniform resources. 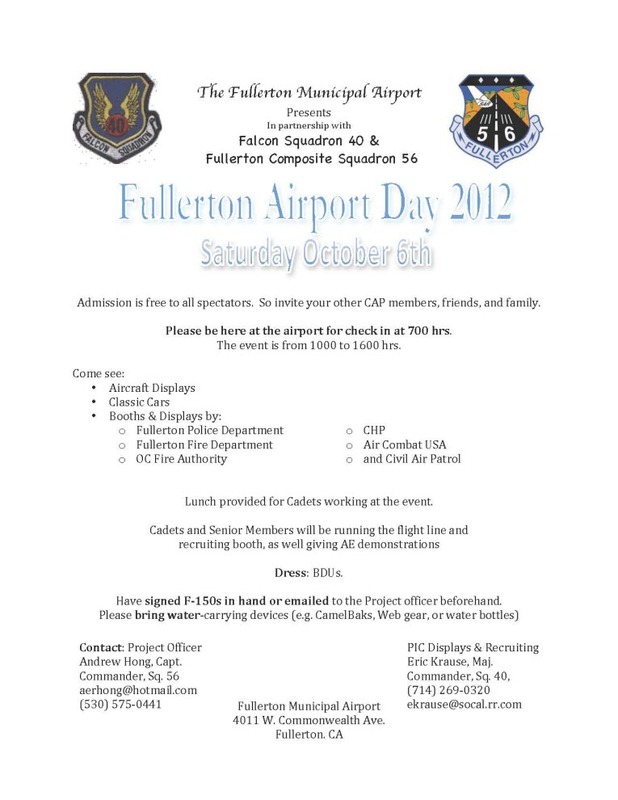 1LT Hong, Commander of Squadron 56 and I have been working with Fullerton Airport to support their Airport Day which is coming up on Saturday, 6 October. This is an open house not an air show. It is an out reach event from the airport to the community. This is a recruiting and public relations opportunity for CAP and an opportunity for Cadets to gain experience with crowd control and airport activities. Squadron 41 is planning to fly in a glider and tow plane, Squadron 68 is planning to bring their SAR vehicle and we will have 743CP there. See the attached flyer for more details. 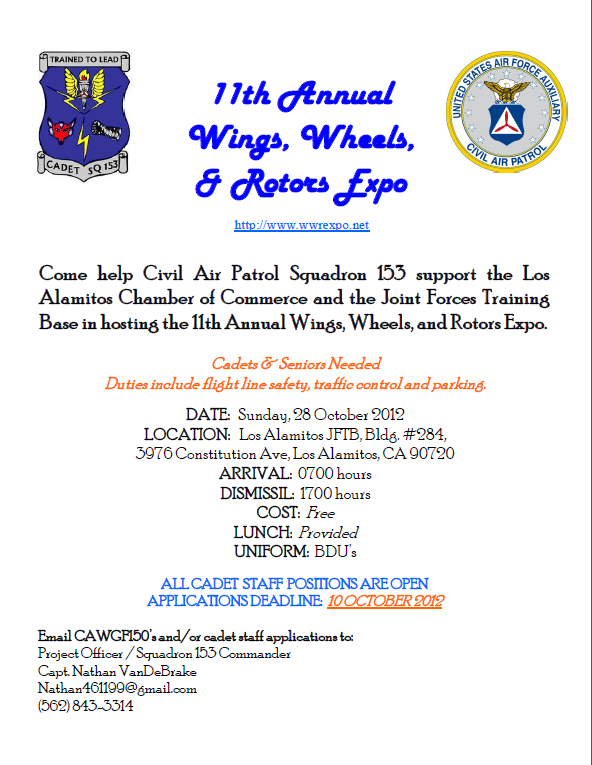 ..do not forget that we have an effort to support Los Alamitos's Wheels, Wings, and Rotors on October 28th as well. Both of these will be excellent recruiting opportunities. delays by about 21%, providing $22 billion in cumulative benefits to the traveling public, aircraft operators and the FAA. A low cost receiver is needed for general aviation access to ADS-B weather and traffic data. Before anything, I ask that you take a quiet moment and remember those who gave up their lives eleven years ago today at the World Trade Canter, the Pentagon, and in that field in Pennsylvania. Also add to your prayers a remembrance for those members of our armed forces who have paid the price for our country, our defense, and our way of life. On another matter, we had a grand old time at The XO's digs: good food, libations, a pool and jacuzzi and even come policy was covered. Think of it as a Red Robin session al fresco with bathing suits. Thanks to those who attended and much thanks to 1LT Kevin King -- our XO -- for his hospitality. We will have a presentation and discussion of CAP awards, ribbons, and professional development by our two PDOs, 1LT Civalleri and CAPT Kokonas. Also, I want to provide some insight into CAP/USAF uniform and accoutrements. Additionally, Lt Col Wolf from SQ 40 will be on hand to discuss their fundraiser. I know that several of you want to participate so you can address questions, comments to him then. The arrangements for the Group 7 Awards Banquet have been set! CAP Members, families, friends, and all interested parties are invited to come and celebrate Group 7's outstanding members and all that they do! This is a reduced cost for the food, as Group 7 will be kicking in a little bit of cash to keep the price as low as possible. Price includes lunch, all-age-appropriate beverages, and dessert. Awards to be presented naming the Group 7 nominations for CAWG Awards. You can either send in your reservations with payment, or reply via e-mail and pay at the door. By E-MAIL, send name and number in party to johnd@bptresults.com and pay at the door. Note that I sent out a notice last week and they needed you to respond by Saturday. If you plan on going perhaps it's not too late. But send Lt Col DiGiantomasso that e-mail promptly. overnight. The rodents will find your stash. away from your building to prevent rodent nesting. invitation for rats and mice to enter your building. Contact DPW immediately to submit a work order to repair these simple issues. Still time to register; hope to see you all there. ..that's it for the moment. (Except for the ubiquitous compass announcement: I still have four available.) See you Thursday!